This post about the Boston Marathon Bombing has been updated over the years as I’ve remembered details and wanted to share more. What was not included is that I was 7 weeks pregnant with my first daughter, Annabelle. I instantly I knew he was going to propose. Can you see the excitement on my face? 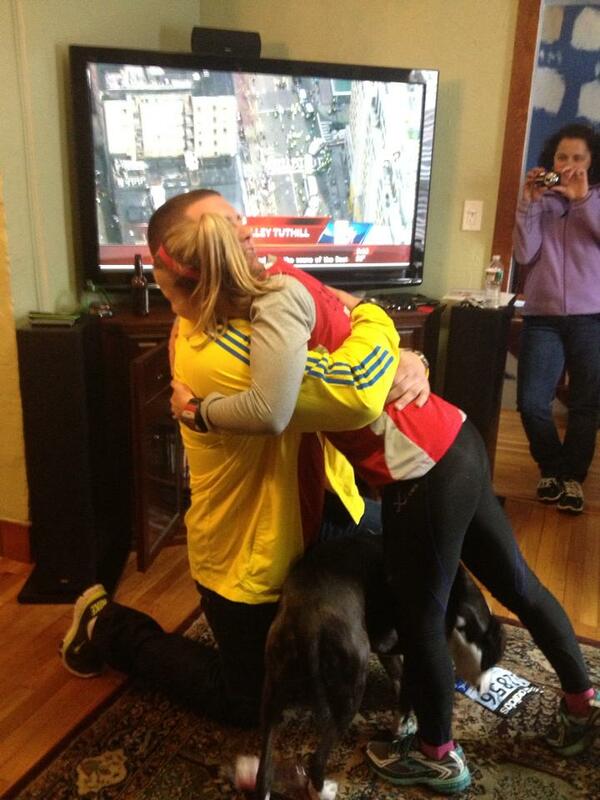 Melissa always told me her dream proposal would happen as she crossed the finish line of a big race. 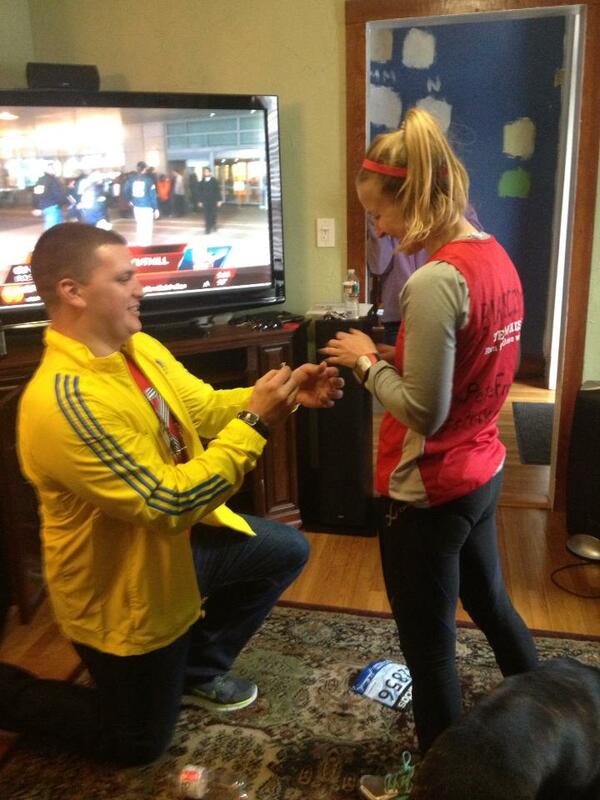 She imagined her boyfriend surprising her with the big question every girl wants to hear and a shiny ring. 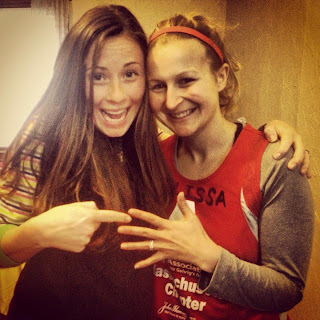 The first time she shared her marathon finish line engagement hopes was over a year ago – had no idea she would ever even run the Boston Marathon when she told me this. But now, on this incredible day, her dream would come true. Andrew had everything planned for a perfect proposal. He scored the necessary credentials to be don a volunteer jacket and work at the Gatorade tent. He also was in touch with The Boston Herald and a news crew – this proposal would be a big deal! The media wanted to interview him before the Big Question and then video tape him proposing to Melissa at the finish line. After he met with the press, he told us we would be able to stand on the corner of Boylston and Dartmouth, less than 100 yards from the finish line, so the news crew could film a clear shot of Melissa as she finished the 26.2 mile race. Melissa’s parents, Andrew’s parents, my mom, and I were so excited we could not contain ourselves. The mothers of the groom and bride and I kept tearing up as we anticipated her arrival. We had front row seats in the area where the runners were congratulated by announcers on a lifeguard stand as they walked towards the recovery area. 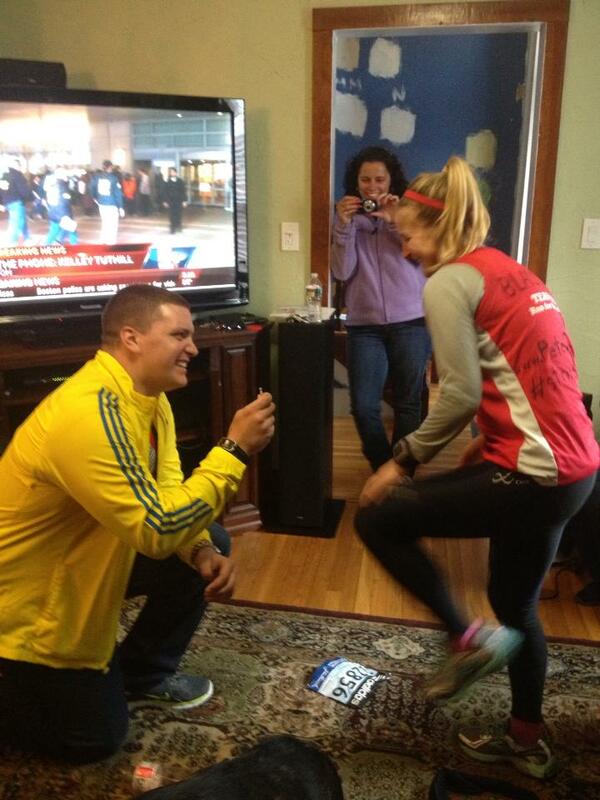 Andrew was miked by a local news station and The Boston Herald decided to set up a camera on the proposal spot. 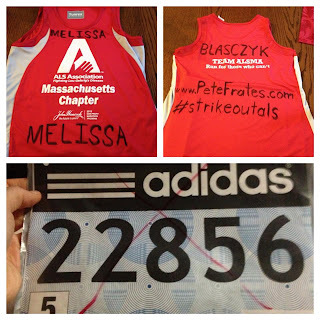 We tracked Melissa’s run on the Boston Marathon webpage, so we knew when she was would be getting closer to the big moment. Then the website stopped working. I tried to refresh the site over and over again on my phone, but it was frozen on her last check-in. I took the photo above minutes before the first explosion. 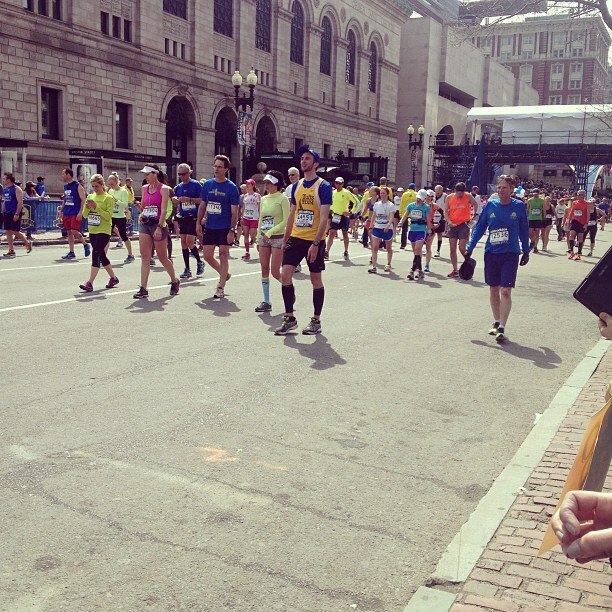 We figured there was an overflow of internet traffic, and focused our attention on the runners approaching us. We were cheering as we stared anxiously at the finish line when the first bomb went off. The explosion was the loudest sound I have ever heard. I felt the Earth shake beneath my feet. My ears were ringing. There was smoke and lots of screaming. I prayed that my eyes were playing tricks on me – but I knew it was something serious. Without thinking I began yelling, “ITS A BOMB! ITS A BOMB!” Melissa’s parents and my mom told me to calm down, but seconds later, the second bomb went detonated. The looks on their faces, and the others around me, were of pure terror. We were all frozen with fear as people started sprinting away from the smoke. And then, my heart stopped. Where was Melissa? I kept picturing her all alone. Happy she was almost done. No clue she was about to have her dream proposal come true. Sirens. Screams. Crying. Wailing. People running for their lives. I can only describe what I witnessed as something out of a movie. As I started to fall to the ground, my mom caught me and hid my head in her jacket. She said there were people missing limbs that she didn’t want me to see. Andrew and his father rushed towards the chaos – screaming Melissa’s name. Melissa’s Father told us we had to get away from the area in case another bomb exploded. I don’t know how far we walked, rushing around the city, trying to find Melissa. The seven of us walked holding hands and only stopped to try to get cell service. I must have called Melissa 100 times before my phone died. I can’t imagine how my family felt seeing the breaking news and not being able to get a hold of us. All cell service was shut down for some time immediately after the incident. My husband told me he had to delete the frantic message I left him after the explosions. I was trying to tell him I was okay, but it was hard to hold it together. My sister thought my message said there were gunshots and she was frantically trying to call my mom and I. My cousin texted me minutes before it happened, saying “Your girl is almost done!” and her text wouldn’t go through. Her coworker asked if we were at the finish line, and Sam said, “Yes, why?” Her coworker told her there was a bomb that went off right on the finish line. We received a short text from Melissa, “R u ok?” after an hour and a half since the first bomb went off. We all started crying and embracing as we realized she was all right. We made plans to meet her at her house a few miles away. She was only 1/2 mile from the finish line when they stopped the runners. She had no idea what was going on and just turned around to start walking. She was all alone and clueless. By the grace of God, her friends walked out of Fenway as she walked by. They told her what was happening and walked with her to a Dunkin Donuts where she got a ride home. There were tears and hugs when we were reunited with her. 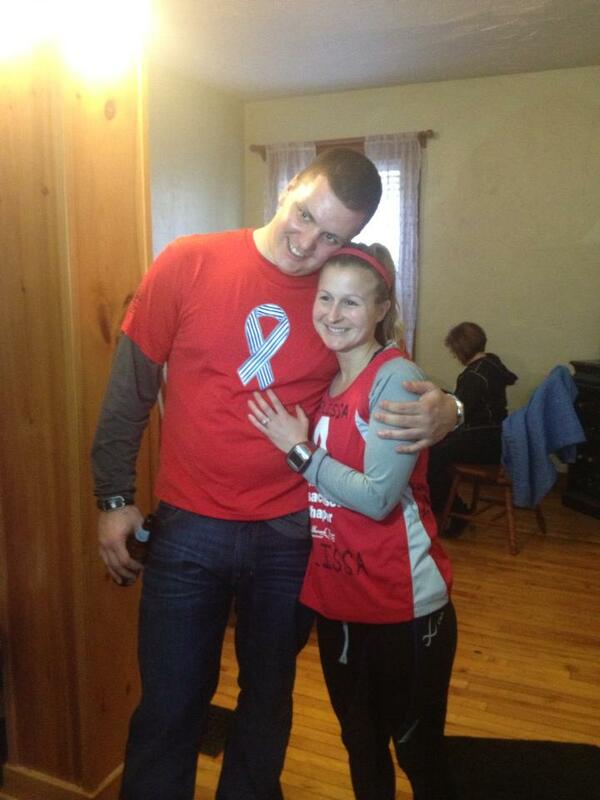 Andrew was not going to let anything ruin his proposal, so minutes after she got home, he got down on one knee. She hadn’t even taken her shoes off yet. I can’t stop thanking God and the angels that were protecting all of us yesterday. Melissa had slowed her pace during the race, which kept her from being even closer to the finish line when the bombs exploded. She said that she wasn’t even feeling the race and I truly believe it was a gift from God… she slowed down and stopped to stretch a few times. I am so thankful that we weren’t standing where we had planned. I can’t stop replaying the images of the first explosion in my mind. I was up at 3:30 this morning, too afraid to close my eyes because I didn’t want to relive it anymore. Who knows what would’ve happened if we hadn’t moved. Amidst the horror of yesterdays events, something joyous occurred. Congrats Mo and Rugg. I love you both. And a big THANK YOU for all of the thoughts and prayers from the bloggers who reached out to me yesterday and today. I am truly moved by your care and concern. I so glad to hear that you are OK! It’s so crazy to think of the slight differences and obstacles that God puts in our way to keep us from danger. What a great ending to a horrific event. I pray for peace of the families and victims and that you will soon forget the images that you saw today. It will definitely be hard to come to terms with what I saw and knowing what occurred at the race. The people who were coming through the finish line were those that had raised hundreds of thousands of dollars for charities, so for some to witness such a horrific event just breaks my heart. I have chills reading this story. Thank you so much for sharing this. I love that he proposed anyway!! Thank God all of you are ok! So glad you, your friends, and family are ok!!!! God is good. OMG, I’m not sure how you even had the composure to write this post so well. I’m so glad you are all OK and that the proposal still happened and you were all together. God was truly watching over all of you yesterday. I can’t even imagine what you must have experienced/seen/felt. So thankful you were all ok and sending prayers your way that you can all focus on the happy ending of the day rather than the terrible images you must have seen. I am so glad that you shared your story! God was watching over you & your friend during her race. I cannot imagine what must have gone through your head in those first moments. Terrible events on such a tragic day that should have been nothing but happiness. Thankfully you and your friends are all okay and what a beautiful ending to a sad day! I am so glad you are okay. I cannot imagine the experience. We all have to focus on the good that is in all this evil, as hard as that may be to do. Again, so glad you and your friends/family were okay. This post brought a mix of emotions to me as I read it. I’m happy you’re all okay, but I’m incredibly sorry that you had to experience that. I hope everyone else you know is safe and sound as well. Congratulations to Mo and Rugg! Wow, so so scary. I’m so glad everyone is ok. Such a huge tragedy. On a positive note, congratulations to the couple!! Wow. I am not really sure what even to say about all of this. I can’t imagine being so close to all of that. I am glad you are all OK, and I think it is just wonderful that he went ahead and proposed to have something so beautiful and joyous come out of the tragedy of that day. Very special. Again, thank God you and your friends and mom are ok. This is an amazing story. I had to share on fb. wow. what a amazing story. angels were definitely watching over you, your family and friends. what happened in boston is such a tragedy but the engagement of your friends is something special. a day you will never forget for a number of reasons. I’m so glad you and your friends are okay. I’ll be praying for you and everyone else who was there. Rugg’s proposal at the end of the day was proof that we can’t let the terror defeat us. I am so glad you are all okay! That is amazing! So awesome to see something wonderful happen after something so terrible. This story had me in tears. So happy something good came out of something so tragic. Wow. Just wow. How terrifying. So glad you guys are all okay though and something good came out of the horror. So glad you are all ok, and I think you’re right that someone was watching over you all. Light comes thru the dark and this is a perfect story to show it. I totally teared up! My heart stopped again reading this. Such a happy thing to come out of such a tragic day. And you had angels watching over you, thank God. I’m sure you’ve seen news and pleas from Boston PD — if you have any pictures or videos from where you were standing pre-explosion, PLEASE share them. Even if you think they mean nothing please share them. Oh my word! So glad everyone from your circle is okay! So happy that you and everyone you were with is ok. It really is tragic and I still can’t believe it happened. On the positive side, congratulations to your friends! I’m still in disbelief. I’m so thankful you’re ok! LOVE YOU! I am so glad you are okay!! I was so worried about you all day yesterday hoping you were okay. I know God was with you and made sure you and your loved ones were safe. I’m so glad everyone is ok and that there was some good that came out of this with the proposal. This is a crazy story!!!! Oh my gosh!! So glad that you and your friends are ok and that they are happily engaged! Wow! I came across your story on Facebook. And that is absolutely crazy. I heard one of the men that died had plans to propose that day. Which makes it so incredibly sad to think about each personal story one of these lives contained. So glad your friend AND YOU were okay! gosh, this post left me me tears. So happy that you and your family/friends are okay! I teared up reading this. I don’t know you at all, and have only been following you for a short time, but as soon as I read about the explosion I immediately thought of you. I didn’t believe it because I had literally just read your post about heading there, and I panicked. When I got your response I was so relieved. It hurt my heart reading his elaborate plan and how it got ruined in such a horrific way. I’m extremely happy he didn’t let it bring him down, and that all of you are okay. Your story is absolutely terrifying. I’m so glad that everyone is ok. I have tears in my eyes… ugh I’m SO glad you and your friends and family were okay. I am so sorry you had to experience that and I wish no one had to endure that. So terrible. But congratulations to your friend and I hope they will think of this day as a happy day for that reason. Xoxo. Wow! What an amazing story of the protection of you, your family and friends. Thank you for sharing this. It is good to know that in the midst of such a tragedy, there is gratefulness and joy. I just started following your blog last week and remembered I had seen something on a blog about the Boston. I’m so glad that you, your family, and your friends were ok. My dad has a coworker who has run the Boston Marathon who decided on the last day of registration this year that she wasn’t feeling it. Based on her previous times, she would have finished right about the time the bombs went off. Goosebumps. I got chills reading this post, and maybe a little teary eyed. So happy to hear a beautiful story come out of all this. God was def. watching out for you guys yesterday. Love happy endings 🙂 Not all is well in the world but for you, your family and friends, all is good. Angels were with you! Thank you for sharing your experience, can’t imagine all the thoughts you are working through right now! Big hugs to you!! WOAH. Thank you for sharing your story with us. I’m sure you’re still processing much of what happened yesterday. And thank you for sharing that story of joy within a very tragic event, nothing can stop the greatness of love! Congratulations to Mo & Rugg! The blogosphere is such a strong, united community that reading this made my heart sink, as if you were someone I knew personally. I am very glad and grateful that your loved ones and yourself were unharmed and ok. The fact that you were there and seen everything sends chills up my entire body. I’m happy y’all are all safe. Congratulations to Mo & Rugg, that’s so exciting for them. Oh my gosh….I can’t believe you were there. I’m sooo thankful that you, your family and friends are ok. How scary!!! I can’t even imagine. I hope and pray they find out who did this. I can’t stop watching it on the news….hoping they get some clues. Congrats to your friends on their engagement!! Sooo glad your friend didn’t make it to the finish line. Give God the praise and stay safe!!!! Again I am so glad that you and your friends and family are safe! 🙂 This story made me cry… I just saw your short quick posts on ig all day yesterday. I am so glad your angels were watching over her. Oh my goodness! What an incredible story! I’m so glad that you and your family/friends were all safe! And so happy for your newly engaged friends! So exciting!! I’ve always thought that would be a fun way to get engaged, too! I am so glad you guys had such a happy ending and that you’re all safe! I don’t even know what to say. Thank God you and your friends are safe. It’s a wonderful thing that your friends can look back on this and see joy come out of something that was so dark. I’m sobbing as I read this. I could never imagine witnessing everything that happened. I’m so glad that you were all able to have the happy ending to the day that you had planned on having. I’m from Michigan and there was a couple on the news from here that said they were suppose to finish around the time of the first bomb, but then one of them had a cramp and they decided to stretch which set them back a few minutes. I’m so happy that you and your loved ones are safe! What a story! I am so thankful y’all are all ok and the proposal still happened! She is so lucky to have a friend like you! Even though I have tons of tears streaming down my face at this very moment that is such a sweet ending to such a horrid day! I am glad you all was ok & my heart breaks for those others whom was injured or lost loved ones! This post made me cry. I’m a new reader but I was sent here from Follow the Ruels blog. This was her favorite post from the week. I know I don’t know you, or your friends or family, but I’m so glad that you all are okay and that he did get to propose. I LOVE how he still proposed because he wasn’t going to let evil win. Congrats to your friend, and praise God that you all are okay! I’m laying in bed next to my husband and tears are streaming down my face. I’m so thankful to have him and it makes my heart break thinking about those who lost their loved ones 🙁 I’m happy to hear that you, your fam and friends are physically okay and I hope that your emotional healing comes soon. I can’t even imagine what it must’ve been like to be there. I am glad that some joy came after such a horrific event 🙂 Sounds like God was indeed looking out! Catalyn, I am so emotional right now over this post. Praise God that He protected all of you!! I can only imagine how horrific a scene it was. Wow. Your post had me in tears. Glad you’re okay! Enjoy Entertainer Please see the link- stream host. Hi Caitlin, I too live in CT but I was living in Boston at this time. I’m glad that you and your dear friend are ok. It’s still a hard thing for me to talk about, even though I wasn’t at the actual race that day. I had been many times before. The week that followed was one of the scariest of my life, including the day that they caught the bomber about a mile and a half away from my house, after we had been on lockdown all day. A really upsetting time to be a Bostonian. My heart still hurts for the families who lost loved ones, especially that beautiful little boy, and to all those who were injured that day.